CES 2015: aptX Bluetooth headphones among House of Marley's new products | What Hi-Fi? A "new standard in technology" has been heralded by House of Marley at CES 2015 in Las Vegas this week, with the audio brand announcing the launch of its latest products for 2015. 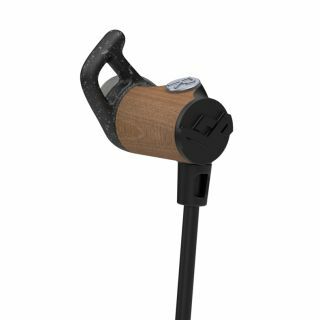 One of the products to make a first appearance at the show are the Journey BT sport in-ear headphones, which come equipped with aptX Bluetooth wireless capabilities. The buds have been created with "content and performance in mind", with an angled nozzle designed for a better fit and a flexible loop to ensure a more secure position when in use. A three-button controller is also provided. The Journey BTs are due to go on sale during the summer for $129. UK pricing is yet to be confirmed. Another of the prominent House of Marley launches at CES is the One Foundation system – sporting a custom glazed-oak wood baffle and magnetic breakaway speaker grilles. It's fitted with the Qualcomm AllPlay smart media streaming platform and boasts 5.25in high-output woofers and 1in tweeters, as well as Bluetooth and wi-fi connectivity options. One Foundation makes use of AllPlay to stream music direct from your mobile device, local server or cloud storage, creating "harmonised synchronisation" in a multi-room scenario. But that wasn't all from House of Marley at CES 2015. The Mystic in-ears ($15), Little Bird in-ears ($15) and Roar on-ears ($40, above) are all due to hit the shelves in the next two months. The Tribute over-ears, featuring 50mm drivers, are due for release in the autumn and will cost $250. The Legend ANC over-ears ($280) also go on sale this autumn. And there were also a couple of portable Bluetooth speakers unveiled by House of Marley – the Chant Mini ($50, March, above) and Chant BT Sport ($100, June) joining the company's ranks. House of Marley senior VP and general manager Sam Vanderveer said: "We continue to push the bar in personal and home audio systems with stand-out products that truly connect people with their music. "Our new product lines tap into uncharted territory and promote a lifestyle that is House of Marley – superior quality, consciously crafted and cause minded."